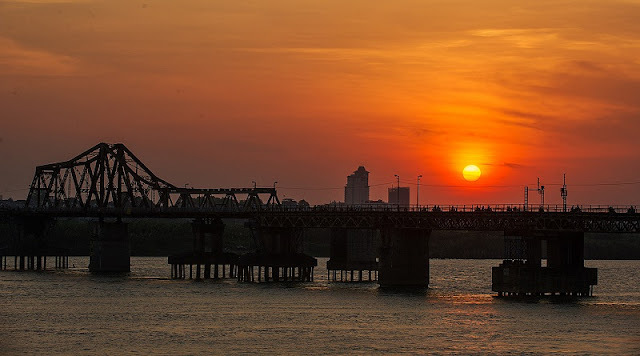 How much beauty in Hanoi is encapsulated in the lyrics, the singing of the famous musicians, and the photos below have described all the impressive features of the capital thousand years of civilization. There are literally hundreds of poems about Ha Noi beauty, but how many people know that the beloved capital shows up in the form of photographers who devote their entire career to writing about a thousand years of civilization that is far more authentic than the lyrics, singing. Each place has its own inherent beauty, and each person loves a place they go through in their own way. If Saigon is beautiful with the hustle and bustle of young people, Hanoi makes sympathy with the early peace, simplicity. 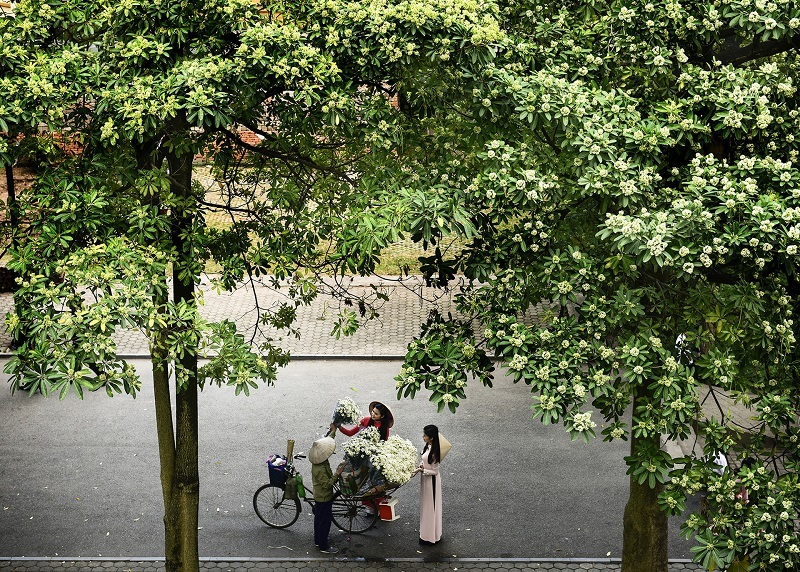 "Wake up very early, cycling through the streets, visit the sidewalk tea listening to three stories of life is also a way to feel the romantic beauty of Hanoi," photographer Giang Trinh sharing. Talking to Hanoi can not help but mention the street flower vendors, one of the familiar image, dear, full of poetry. 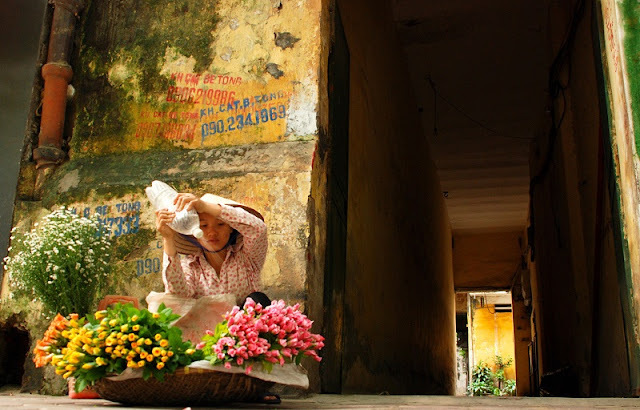 That is why many reporters from overseas come back to the capital often find and create the beauty of the flower vendors in the streets of Hanoi. The most memorable event is every April or October, running along the streets of Yen Phu, Giang Vo or Thanh Nien, you will see the flood of bicycles carrying trumpet flowers or cuc hoa mi ... Just looking, the heart of each person is curling strange. Florists often come to Nhat Tan, Phu Thuong or Quang An, Quang Ba (Tay Ho) markets to bring flowers to the streets early in the morning. And then the corner, alley streets where there are occasional sisters hand pump water, care for their goods are good, looking forward to the end of the day will sell out the beautiful bunches of flowers. Photographer Xuan Chinh said that the daughter of Hanoi beautiful both beauty and luxury and elegance. Since the beginning of the camera he used to take beautiful girls and more or less have a summary of them. He said the young lady is worthy of what literature has praised. And the image of the girl always attached to the flowers and especially the white ao dai pristine, Non La, lightly gently. The northern girls are generally slender and elegant. Living in Hanoi has a good environment, helping women more elegant, more charming. This beauty is enhanced in the fall of Hanoi, with the bouquet of Cuc Hoa Mi or white lily flowers on each side of the road. Arriving in Hanoi, tourists can not overlook the Hoan Kiem Lake area, even though it is very familiar to many. Wherever you are or what you play, every visitor is still around Hoan Kiem district, if you want to watch the sunset, the point can not be overlooked West Lake or Long Bien bridge area. 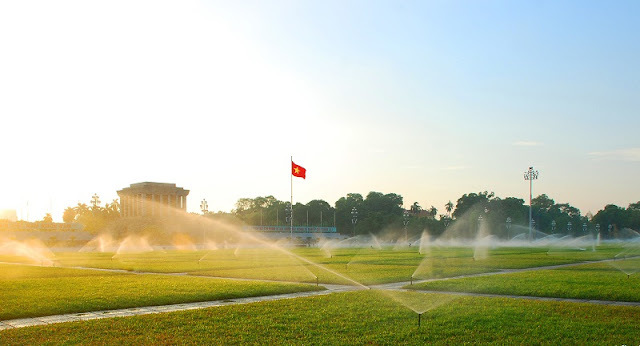 If you are distant, every time you have to sad, tired to try once to set foot in Hanoi, walk through the Sword Lake early in the morning or West Lake late in the afternoon. The last gentle sunbeam of the day combined with space as bustling buzzing by the horn but very quiet that will help you love this life more. Hanoi brings tourists not only the memories from the ancient architecture but also the unforgettable memories from people, cuisine and simple things from everyday life. Hanoi city tour is an interesting idea to help you understand more about Vietnam.